Wilma Morrison, professor of Journalism at Portland State in the 70’s emphatically taught us not to become emotionally involved in our stories. “These are serious times with serious issues, but you need to remain an observer and record history accurately,” she extolled us. Blood drenched clothing, severe gashes, screaming, crying – that morning had it all. And how could I not help but get involved in my story. I may have been a reporter/photographer for the Portland State University Vanguard student paper, but these were my classmates, my constituents, and abruptly those who had been strangers were now my friends. 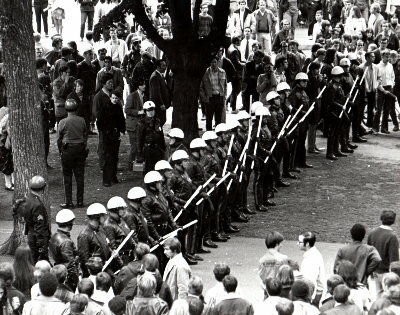 What started earlier in the prior week as a protest against the police and killing of students on May 4th at Kent State, had turned violent before my very lens on May 11, 1970. I was stunned, and for the first time in my sheltered life I experienced the hate that can erupt over into uncontrollable rage. I had followed the students throughout the week. 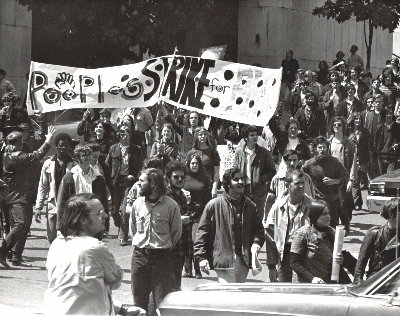 On one day I followed them as they organized in the South Park Blocks in front of the Smith Memorial Union. They formed a large contingent and marched down to the Draft Center. Police were prepared. With batons in hand, they blocked the entrance. A sit-in occurred. 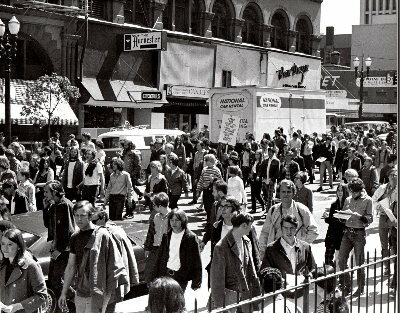 When nothing seemed to be happening, some in the large group began to move forward. 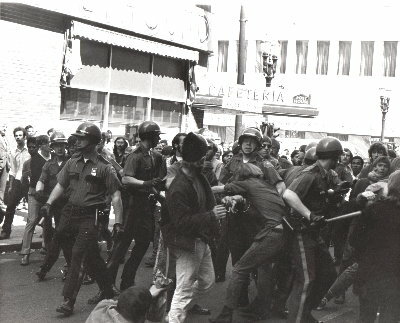 The police pushed back, using their batons in a defensive blockage, arresting a few. 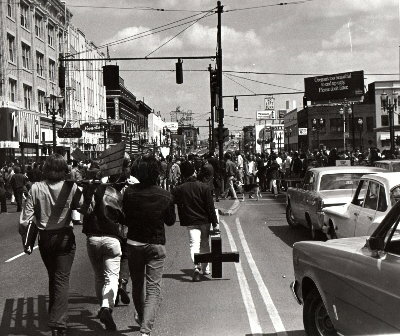 Having met the challenge, the students regrouped and marched down into the retail district on 5th street. They got to Burnside and turned around to come back. 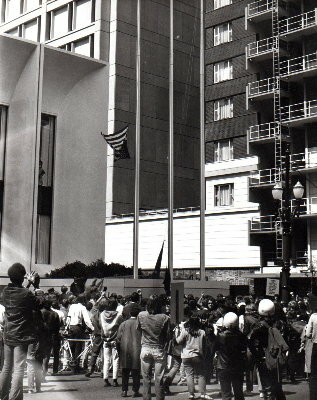 As they moved up SW Broadway, they came upon the Bank of California where the flag poles stood. They lowered the US Flag and turned it upside down, raising it back to full glory. This symbolic protest of the US War effort in Vietnam, angered the citizens around the area who began yelling at the protesters and police. Student had been carrying a park bench along the protest trek. 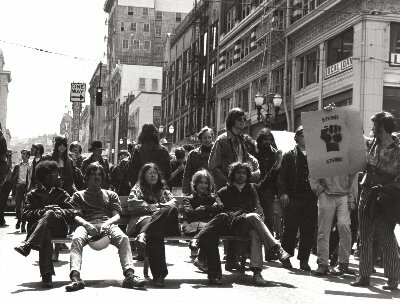 At each intersection they would set it up to block the traffic, sitting casually, smoking a reefer in jest of other laws of the establishment. 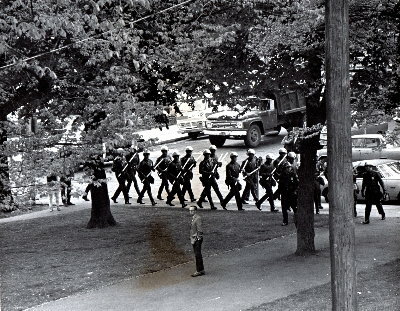 They returned back to Portland State campus without much incident that day. 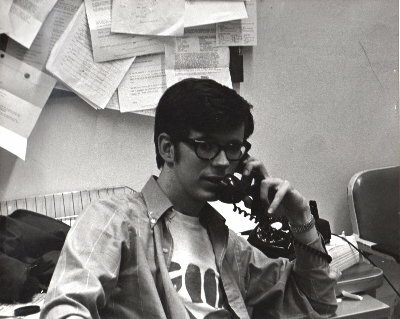 The phone rang in the PSU Vanguard office mid-morning Monday May 11th. The caller said that police buses and cars were assembling up at Shattuck School, on the edge of the PSU campus. I grabbed my 35mm camera and tore down the stairs, running to the top of the Park Blocks. I was amazed by the show of force. I had never seen so many police. My heart was pounding with fear and anxiety. Police in blue helmets began moving down either side of the Park Blocks. Police in white helmets gathered in the center with long white batons. I was a reporter, but it reminded me of the horror I had only seen in movies and nightly news of communist suppression of citizen uprisings in foreign countries. “This couldn’t be real” I thought to myself. The White Helmets began their approach. In synchronized step they made their way between the trees that lined the park, and headed down towards the block bordering SMU. Being led by some sort of commander who was shouting out directives like some drill sergeant, they moved in a straight line towards the tent. There they stood while negotiations frantically continued before the tent. 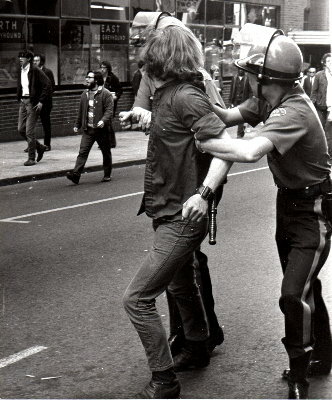 The police wanted it down, or they would take it down by force. The students refused. The police formed their wedge. Batons were lowered into place. Efforts were continuing to negotiate some sort of compromise. 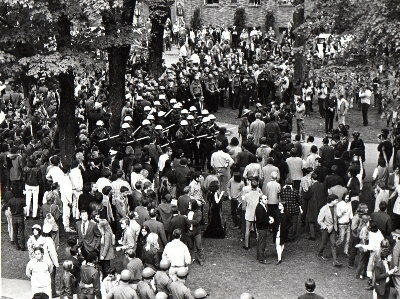 There were the extremes on either side of the issues, and in-between were other students trying to stop any kind of violence on PSU’s campus. I had climbed the stairs to the 2nd floor balcony of SMU to get some better crowd shots. Without warning someone shouted out the charge to move forward. You couldn’t tell if it came from the police commander or one of the exasperated onlookers. 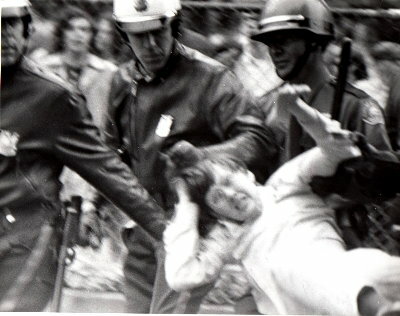 All I knew was that unexpectedly the police began marching methodically forward jabbing their batons forward to knock the air out of anyone standing in their way. The clunking sound of their boots slamming the ground in unison was chilling Then suddenly they dived into the crowd before the tent and students began falling and screaming. Others fought back in a defensive measure. The batons that had been used in jabbing motions now became clubs as the police began hitting the students. My camera shook in my hands. I could not focus. I was screaming. I was mad. I wanted to grab something and throw it. If I had had a weapon, I would probably have discharged it. Suddenly I became aware of the overpowering emotion it takes to push someone over the edge. I was no longer just an observer. I had been drawn in. Along with my fellow students, I felt the rage I never knew existed in my being. While the attack waged on, I had stopped taking photos and began running down a flight of stairs to the scene. I didn’t know what I would do once I got there, but I had to be there. The blue helmet police held the crowds back, while the white helmets finished their job of tearing down the tent. 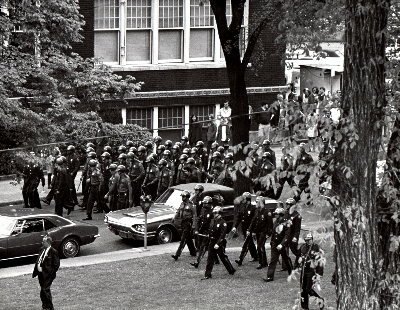 Students ran in from the sides to retrieve the wounded and pull them aside for treatment. In a matter of minutes, Kent State had come home. No one had been killed, but for many of us, our outlook and understanding of the "establishment" had been forever altered. For all my trust, taught by my parents; for all the respect taught by my grade and high school teachers, I was now in denial and enraged hate. That night, students had again erected a memorial on the very spot of the tent. Instead of a tent, candles were lit in a circle in honor of those who had suffered at the hands of the police. In the meantime, word had spread through the nightly news, evening papers, and by word of mouth. 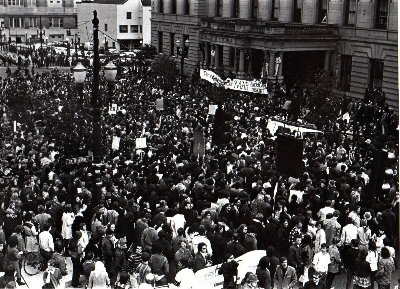 There was to be a march on City Hall the following morning to protest the actions of the police. Their use of force was deemed unnecessary and overly aggressive by the local media. Tuesday May 12th dawned in the same manner as all the days on the previous week. There was excitement all over Portland State that morning. 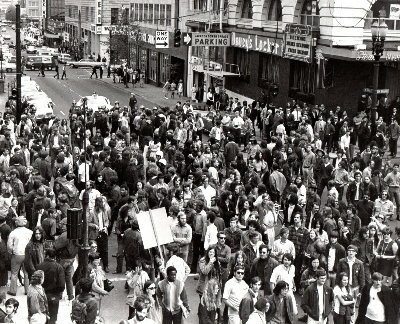 Crowds were beginning to gather in the Park Blocks. But this time, the students were surrounded by mothers, fathers, children and citizens from all sectors of the community. Ministers and congregations joined in. Predictably, the small crowd of protestors of earlier days had swollen into thousands of outraged citizens. 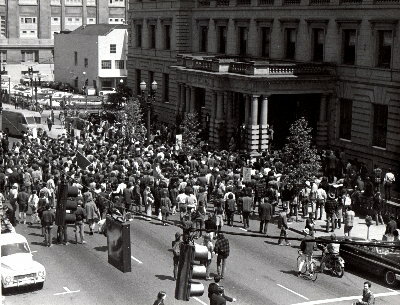 As the march began in the South Park Blocks, it stretched for city blocks. Chanting and angry, the crowd commenced marching towards City Hall. 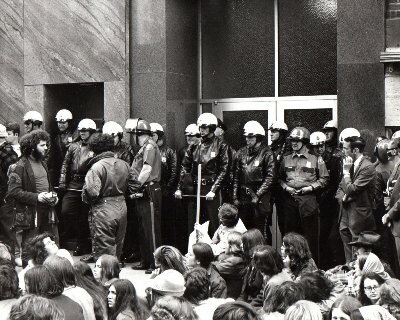 City Hall was blocked by police that morning. There was no riot squad visible, but after the previous day, one could just imagine that they were in waiting, not too far away. Bandaged speakers who had been at the front of the tent on the previous day, began using the bull horn demanding the Mayor’s presence. The crowd chanted and sang protest songs which got louder and louder as the crowd continued to grow with late comers. 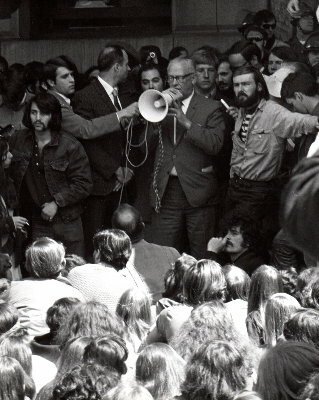 Joe Uris stepped up to the bull horn. Joe Uris was hated or loved depending upon what side of the establishment that your loyalties fell. Some like my parents called him a communist instigator, which to them was one of the lowest tags you could place on anyone. To our growing numbers he represented reason in the face of rampant escalation of what we felt was a ridiculous war without end. I don’t remember what Mayor Terry Shrunk said that day. I don’t remember what Joe Uris said. I do remember that I was different. I remember that suddenly I was no longer my parent’s easily impressionable, dutiful son. I had seen too much, and it had been right here on the streets of Portland, on my university campus, and to people I knew. The world was different, and I was involved. 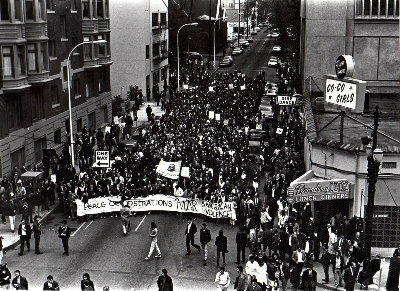 People's Strike for Peace begin their march. 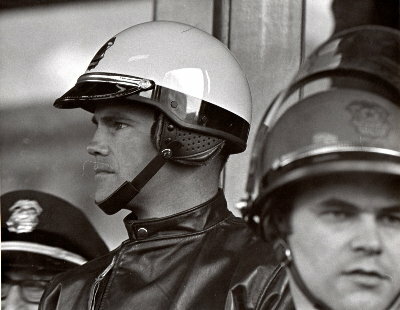 Sterned-faced police guarded the doors. "I am a law abiding citizen. Why don't you shoot these commie-loving, long-haired hippy freaks? How can you let them get by with this?" The police begin their push back of students trying to enter the Draft Center. Arrest of many student-resisters begin. The crowd reforms at the corner of Broadway and Yamhill, outside what is now the Pioneer Building, and on the corner of Portland Pioneer Square. Broadway and Alder streets in downtown Portland. Traffic comes to a standstill on busy Burnside as the march continues up Broadway. 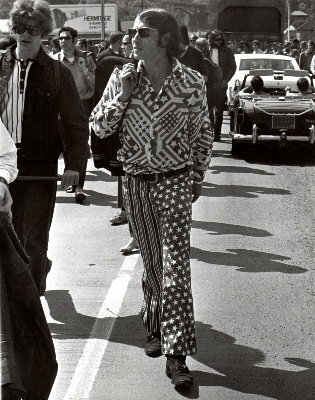 The fashion of the day was stars and stripes! 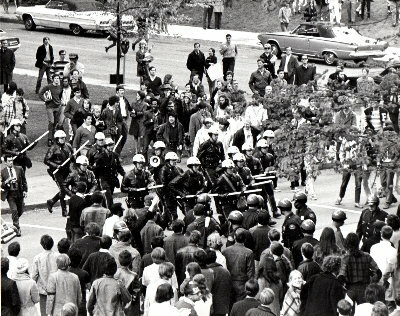 The march comes down 5th which is now Transit Mall. The fence in the foreground is the Pioneer Courthouse. The march was heading north down 5th. will lead no where. He advises them to disperse. Mayor Shrunk is approached by one of the student leaders. On this 8th day of May, the crowd was big, but not too uncontrollable, but that was to change on the following Monday May 11th. Portland Police begin gathering at the southern-top of the South Park Blocks. The blue helmets begin their invasion of the Park Blocks and into history. The truck to the left was there for only one purpose. 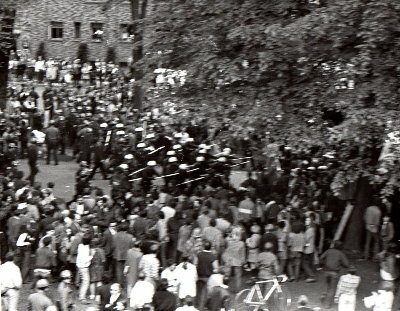 It was to be used for tearing down the barricades and the student-raised tent outside the Smith Memorial Union building. The White Helmets strut into position to come down the center of the Park Blocks. 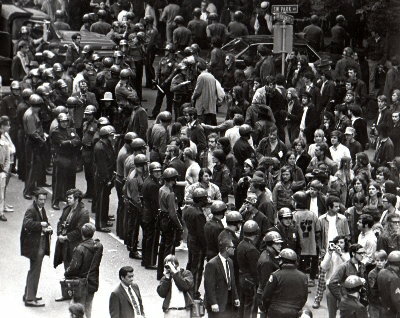 To come down the Park Blocks, police form a "V" shaped Strike Force. 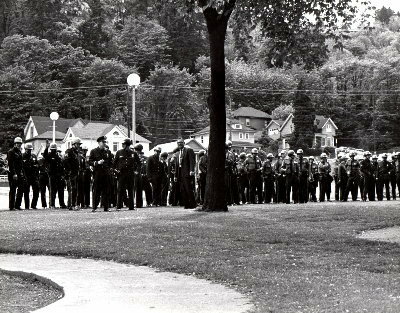 Now in position, the police line up for a full show of force. Batons at the ready, they await their marching orders. The White Helmets have formed their attack position. In the foreground, negotiators on both side attempt to find a solution - a way out for both sides to back down. With no agreement on the removal of the tent, the shout goes out to "Strike." What the exact words were, only those in the front may only know. But to us bystanders and onlookers, we could not believe our eyes and ears. The sights and the sounds would change us forever. Struggling students were pulled away by their hair. White Helmets continue their rampage and take apart the tent. 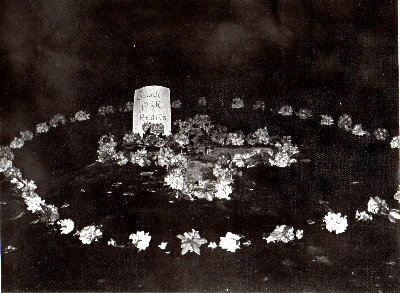 the spot where students had made their stand. 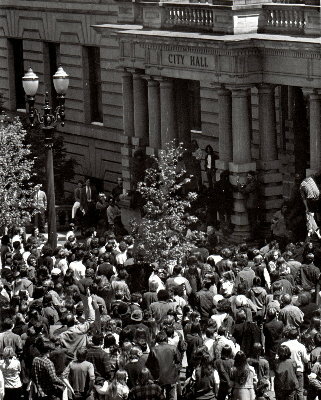 The day after what was termed "Police Riots," the crowds swelled to thousands for a march on City Hall. 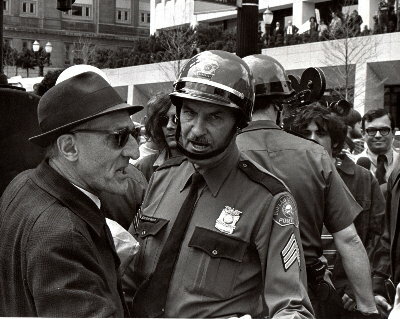 The actions by Portland Police had galvanized those who previously had only been observers. What a difference a baton makes. 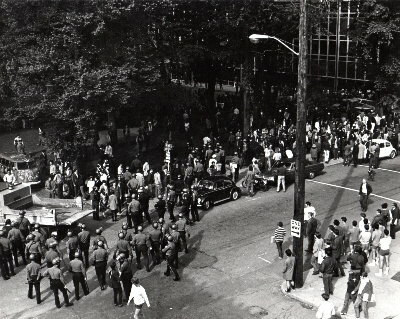 Comparing this photo to Friday May 8th, one can see the impact that the attack had on the citzenry of PSU and the citizens of Portland. 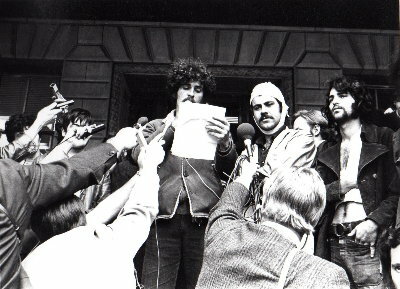 Injured students make demands on the city for their right to gather and protest in the American tradition, without fear of reprisal from Portland Police. 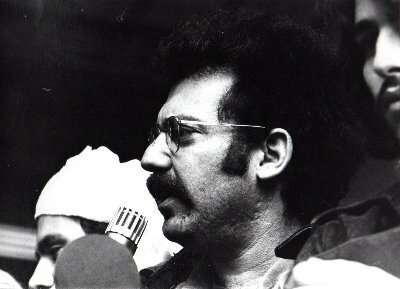 Joe Uris addresses the crowd. 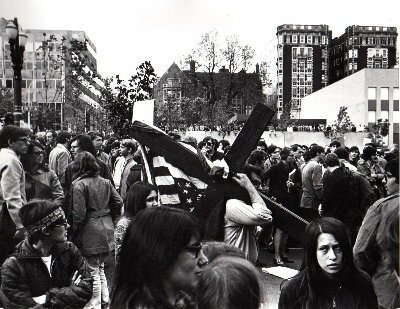 In a sign of oppression, one of the marchers carries a wooden cross to Portland's City Hall. 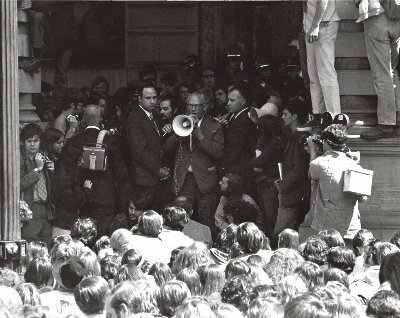 A collection of photos from this period have recently been uncovered in my attic trove, Watch for further photos essay such as Bobby Kennedy's visit to the Portland State campus, just days before he was assassinated in California; Richard Nixon, Nelson Rockefeller, George Romney and more.